A group of local citizens expressed disappointment Monday night after Sackville Town Council stopped short of declaring a climate emergency. To read the resolution, click here. Sackville resident Laura Reinsborough told council during the public question period that “wording does matter” and that the students who marched to town hall on March 15th specifically asked Sackville to join more than 400 municipalities, including Edmunston and Moncton, in declaring a climate emergency. 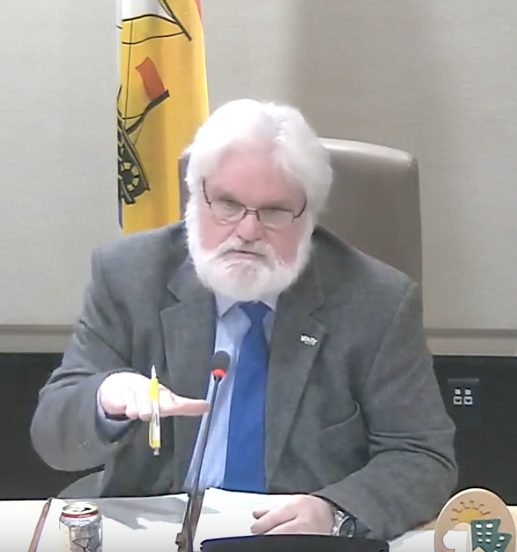 Mayor Higham and Councillor Bill Evans responded that council was concerned about the legal implications of declaring an emergency and therefore, settled on the words “climate crisis” instead. Reinsborough said it’s important to show solidarity with other municipalities by declaring a climate emergency. “Using that same strength of wording, does help send that message that we are being serious about this,” she said. 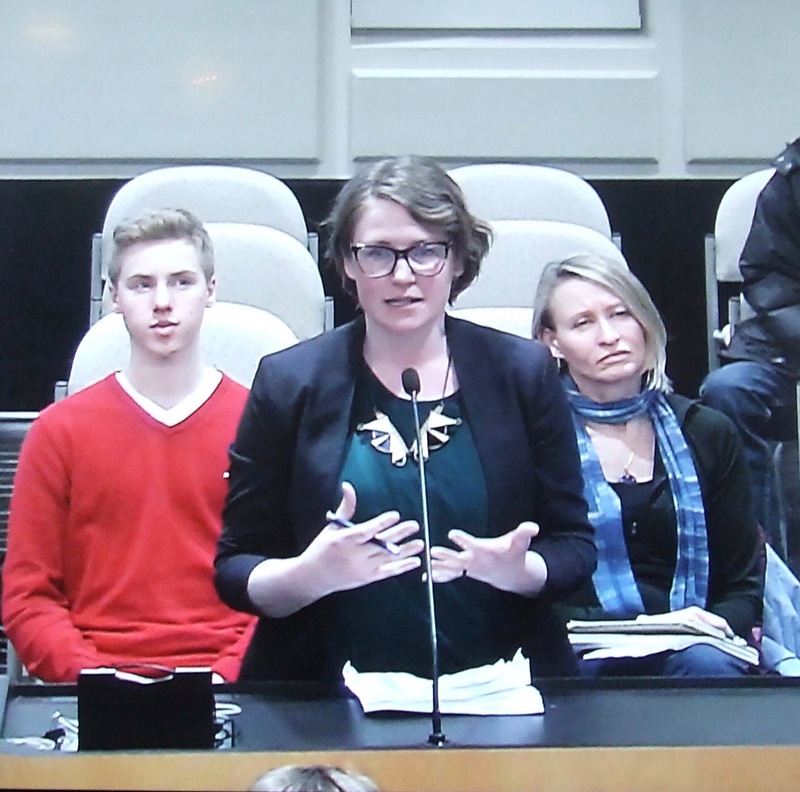 Quinn MacAskill, who helped organize the March 15 march, pointed out that the students had also called on the town to update its 2010 Sustainability Plan in light of the effects of climate change, but that was not included in the resolution that council passed. Mayor Higham responded that, in fact, the Sustainability Plan balances a range of social, economic and environmental issues, but that council felt a more specific “climate lens” is needed in its decision making. “That’s much more focussed on specific environmental and climate factors,” the mayor said, adding that council wants to work toward developing such a climate lens. He also said that the climate change roundtable promised in the resolution would be an ongoing committee comprised of a variety of people who could offer advice and guidance on climate change policies and decisions. When Councillor Bill Evans brought forth the resolution earlier in the meeting, he said he wanted to be able to tell his granddaughter that he did all he could to combat climate change and helped turn things around. To read Evans’s complete statement, click here. This entry was posted in Environment, Town of Sackville and tagged Climate crisis, Laura Reinsborough, Quinn MacAskill. Bookmark the permalink. Maybe Sackville is finally much more reasonable that I ever suspected 😊? Seriously, I was curious about the person(s) behind the website cited in this article under “more than 400 municipalities” (https://www.theclimatemobilization.org/climate-emergency-declarations). I discovered a certain “Margaret Klein Salamon”, a person describing herself as a former clinical psychologist and now into what she calls “climate psychology”. I googled her out of curiosity: https://www.youtube.com/watch?v=Coc1JUzWR-g. With all due respect to all psychologists, what she is describing sounds more like a cult to me than anything else. I was surprised to hear her using terms like “the truth” instead of “evidence” or “science” or facts. She said and I am quoting verbatim: “First step. tell the truth about the emergency or solution or I mean existential problem. Second step: Act like this truth is real. Third step: recruit others to this truth”. No further comment…. This being said, I recognize the climate issue (or crisis or emergency or whatever we want to call the problem). I also recognize the need to do something about this. Thus, I salute my colleagues and citizens, children and adults, who are truly concerned. I thank them for their concern. What worries me is the influence of some charlatans, or too illuminated yet senseless people, on our children and our society. As to Councillor Evans, I feel like asking: What is ”the right side of history”? Is there one right side to history only? Does it mean that the other side(s) are wrong because they may disagree with your side? I am just curious 😊. Cult is the right word…. always enjoy your comments Rima and Louis .. I finally figured out that Louis is the one that they gave such a hard time for defending the rescue of the old church so this legalize is tricky stuff.. I stick to publishing a different version of reality around that resist carbon tax and carbon hysteria; these protestors can make a lot of noise but they will never represent the majority.. that includes our Bill Evans who likes to join protests and rail against development from his comfy retired perch where bills are all paid and worries are few.. Yes many businesses would leave here due to the ‘climate’ that is anti-industry and many just never even got the chance to start here.. Atlantic Windows comes to mind. People reading these comments should keep in mind that your ‘different version of reality’ ranks right up there with Kellyanne Conway’s ‘alternative facts’ – just about as truthful and reliable. (I will look for a lady with dogs on the street whilst walking in town :). You know, I have always taken personal protective measures to avoid being influenced by what could be a cult (ideological or spiritual or whatever), since my early childhood and teenage years (growing up in cvil war). Sometimes, our own passion in life can put as at that risk, I find, in addition to our fears of this or that risk. Hence, the importance of continuous critical analysis, grain of salt, and humour :). To give you a silly personal example (not related to climate change), since I arrived to Montreal at age 17 until now, I have been a “friend” of many churches. I have alternated visits to all of them (usually more around Christmas and Easter). I made the conscious choice of not becoming a member of any one of them on purpose, not even the Greek Orthodox ones in other cities I lived in (despite having faith in my heart and being attached to the childhood beautiful memories of my spiritual roots). I kept this habit in Sackville: every Easter, I enjoy attending a different church for fun. I love them all (including the ghost of the old white beautiful church :)). Seriously, freedom has always been vital for me. Perhaps this freedom of thought mattered even more so because I was far from my family/“home country” whilst discovering myself and my beautiful “adoptive” country (Quebec/Canada). I guess I needed my “impartial” brain during my adaptation journey :). As I often point out, the economic destruction brought by the policies of this crowd likely result in… more people *driving* to Moncton for work. One only has to attend a council meeting and have any type of differing view with councillor Evans to know that if your not on his side of any issue, your on the wrong side. He is closed minded to say the least. He doesn’t impress me and I have stood up to him and he does not like anyone who will dare to question him on anything. Very sad to see in town leadership. I’ve done my bit to stand up to him and the rest of his bunch at Town Hall, too. Sadly, attempting to do so in what passes for a legal system in this province, I concluded that any hope of redress through that forum in NB is largely (*) an exercise in futility, albeit an eye-opening one. I further concluded that NB, and especially Sackville, are not good environments in which to be in business, especially one that is dependent on a fair legal system. They “won”: I took my business elsewhere, and my only regret is that I didn’t do so sooner. I suspect that, over the years, untold thousands have come to the same conclusion and flat out left. That’s why NB is one of the “have-not” provinces. (*) Justice Dionne of Moncton QB is the only one of the judges I’ve dealt with along the way whom I would say is truly deserving of the title.